U.S. volunteers were pretty positive about the hypothetical discovery of E.T. ITSY BITSY ALIENS Americans would probably welcome the discovery of microbial alien life. AUSTIN, Texas — If alien microbes crash-land on Earth, they may get a warm welcome. 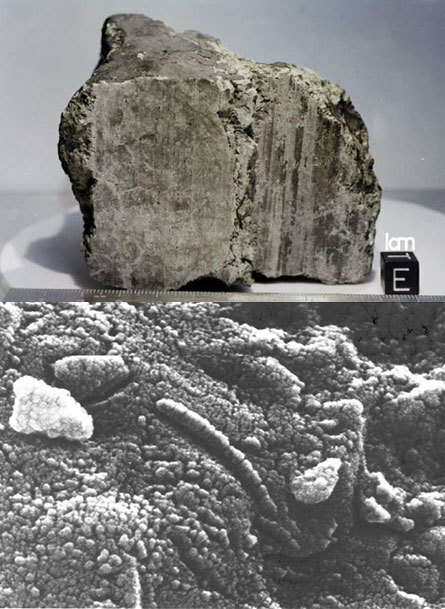 MARTIAN MICROBES In 1996, a Martian meteorite (top) made headlines when researchers reported it might have harbored microbial alien life (bottom) — a claim that has not found widespread support among the scientific community. People generally used more positive and reward-oriented words than negative and risk-oriented ones to describe their anticipated reactions. The same held true when participants were asked how they expected everyone else to take the news. In another study, Varnum’s team asked about 500 U.S.-based volunteers to read one of two newspaper articles. One from 1996 reported the discovery of evidence for fossilized Martian microbes in a meteorite (SN: 8/10/96, p. 84). 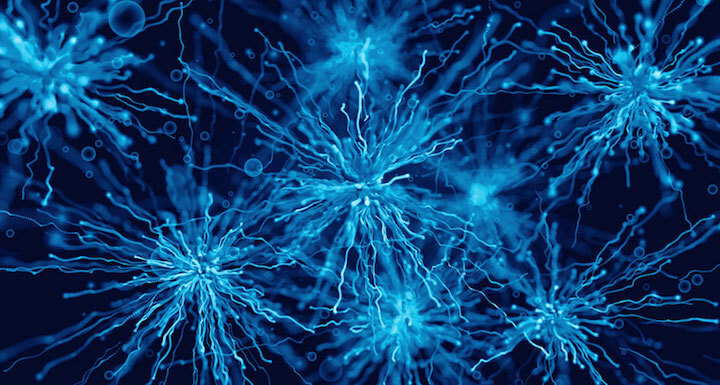 In the second, researchers announced in 2010 that they had created a synthetic bacterial cell in the lab (SN: 6/19/10, p. 5). Both groups responded favorably to the articles, but the people who read about Martian microbes had a more positive reaction. This suggests that while people feel good about discoveries of any previously unknown life-forms, they are particularly keen on finding aliens, Varnum says. But “any finding that comes from one population — like Americans — you have to take with a grain of salt,” Varnum says. He and his colleagues now hope to gather responses from participants of different cultures, to compare how people across the globe would take the news of alien microbes. Psychologist and SETI researcher Douglas Vakoch, who heads the nonprofit organization Messaging Extraterrestrial Intelligence in San Francisco, suggests researchers also gauge reactions to different scenarios of alien microbial discovery. The Martian meteorite described in the 1996 article “has been on Earth for a long time and nothing bad has happened,” says Vakoch, who wasn’t involved in the work. “That’s a really safe scenario.” But, he wonders, are people as gung-ho about the prospect of finding live microbes on other planets or aboard meteorites? And what if the aliens were intelligent? “If you find intelligent life elsewhere, [you] know that you’re not the only kid on the block,” says Seth Shostak, an astronomer at the SETI Institute in Mountain View, Calif. Knowing that human intelligence isn’t so special after all could provoke a much different emotional response than finding mere microbes “like pond scum in space,” Shostak says. To get a sense of how people would feel about finding intelligent aliens, Varnum analyzed reports that the interstellar asteroid ‘Oumuamua could be an alien spaceship (SN Online: 12/18/17). The news articles took a largely positive angle. So the broader public might also take kindly to the discovery of little green men, Varnum says. Also presenting was Lindy Elkins-Tanton, director of the School of Earth and Space Exploration at ASU, co-chair of ASU’s Interplanetary Initiative and principal investigator of the NASA Discovery Mission Psyche, who was scheduled to talk on the future for humanity in space; and Paul Davies, ASU Regents' Professor in the Department of Physics and director of the Beyond Center for Fundamental Concepts in Science.